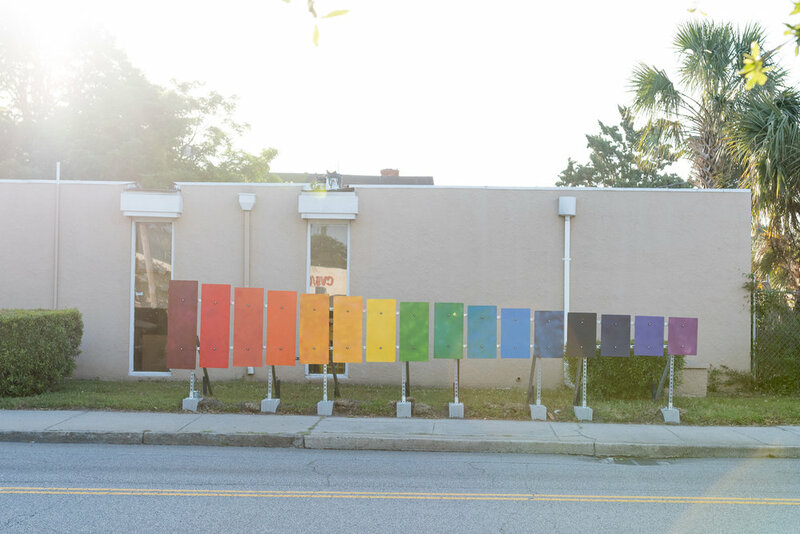 Painting series of childhood nostalgia and urban landscape culminate here through the inspiration of Enough Pie’s AWAKENING MOTION and a collaborative effort from artful friends and neighbors in Charleston's North Central community. Landing an interactive sculpture in an unexpected street setting, the Xylo-Play offers a graduating sonic response with an elongated strike or rhythmic gong. The public piece is a structure of 16 steel notes and incorporates other familiar street materials. Referencing a giant child’s toy, Xylo-Play is a playful beacon in an urban environment that welcomes pedestrians and bikers to use motion in creating music and art. Many thanks to Reverend Dash and the First African Evangelical Church community who are sharing their yard to host a temporary art piece on this swath of King Street.